MIDWEST MATCH-UP: Tonight marks the first of four meetings with the Griffins this season, and the first of two visits to Grand Rapids’ Van Andel Arena. The Roadrunners are playing the final of a four-game road trip; they’re coming off of a 2-1 overtime loss to the Chicago Wolves on Sunday. The Griffins are playing the second of a three-game home stand; they’re coming off of a 4-2 loss to the Hershey Bears on Saturday. WHILE AWAY: The Roadrunners have earned five of a possible six points through the first three games of their current four-game road trip while posting a 2-0-1-0 mark. Following tonight’s game, the team will return home to begin a six-game home stand. Can they finish their trip without a regulation loss with a solid outing tonight in Grand Rapids? MR. 600: Defenseman Andrew Campbell will play in his 600th career American Hockey League game tonight. Prior to his time in Tucson, Campbell played in 414 games with the Manchester Monarchs (2008-14), 40 games with the Portland Pirates (2014-15), and 141 games with the Toronto Marlies (2015-17). Through 599 AHL games, Campbell has registered 136 points (31G, 105A). CLAMPING DOWN: Since surrendering three power play goals to the San Diego Gulls in their season opener on October 7, the Roadrunners have killed off 12 of their last 13 penalties, allowing only one man-advantage tally since. To make matters even better, the team has scored shorthanded goals in consecutive games, courtesy Dakota Mermis and Nick Merkley. The Griffins come into the night 5-for-25 on the power play through six games played, a 20% success rate. THE CHAMPS: The Roadrunners will get to see a Grand Rapids team that is fairly fresh off their 2017 Calder Cup Championship season. The Griffins were a stingy 25-11-0-2 on home ice at Van Andel Arena during the 2016-17 regular campaign, and clinched the AHL championship in their home building on June 13, 2017. 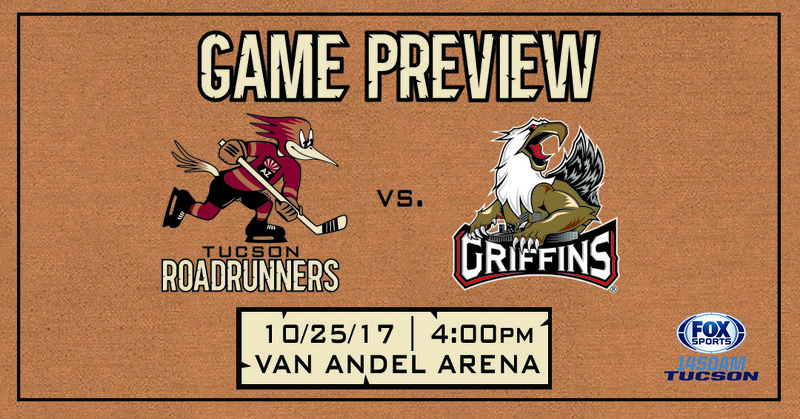 The Griffins are 1-2-0-0 in through three games at home thus far; can the Roadrunners dampen Grand Rapids’ spirits with a road win tonight?